Paro, Haa Valley, Chele La Pass, Bumthang, Jakar Festival, Trongsa, Phobjikha Valley, Metsina, Punakha, Thimphu, Tiger's Nest & more! Bhutan is a remote place of remarkable natural beauty with a pristine and intact environment and a friendly, tradition-bound people. For the discerning international traveler who has been everywhere, Bhutan may just be the final frontier. This tiny kingdom, barely the size of Switzerland, zealously sequestered itself from the rest of the world for centuries. It only opened the doors to limited tourism few decades ago. 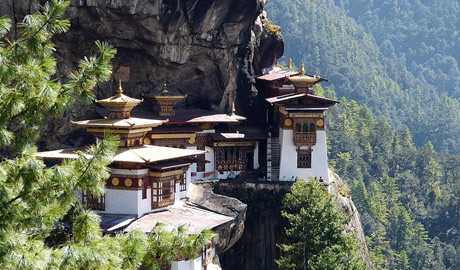 Travel to Bhutan is really an exploration of traditions and a culture that has been preserved through the centuries. In Bhutan we are not going to see some display or cultural park that has been created for tourists. Rather, we will be sharing a true life experience with the Bhutanese. This tour involves some hiking and travels to several new locations that we haven’t seen on previous tours. Come with us through a doorway to a world unlike anything you’ve ever experienced before. 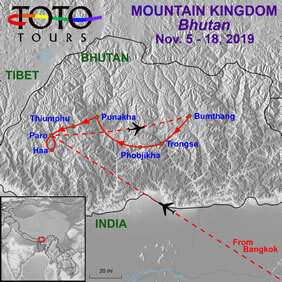 Tour services commence in Bangkok very early today when we meet at the airport to catch our early morning flight to Paro, departing at 5:00 am and arriving in Paro at 8:20am. You will need to check in for the flight at least 2 hours before departure, which means arriving at the airport no later than 3:00am today. We encourage you to arrive a day or two early into Bangkok to recover from jet lag and to avoid having any unexpected travel delays impact your Bhutan tour. For convenient access to the airport for our early morning check-in, we recommend you stay at the Novotel Bangkok Suvarnabhumi Airport Hotel . Our flight to Paro crosses the Himalayan Mountains, affording spectacular views of the jagged peaks, including the sacred Jumolhari and Jichu Drake in Bhutan. On arrival our representative greets us and provides a panoramic overview tour of Paro. We will visit Drugyal Dzong ruins with a view over the town, and the Ta Dzong Museum. Once our hotel rooms are ready for check-in, we'll settle in and relax after our very early start this morning. Dinner and overnight at our hotel in Paro. Today we plunge right into our adventure with an exciting drive to Haa via Chele La Pass, which is at 13,087 feet elevation. The pass is dotted with colorful Buddhist prayer flags and offers incredible vistas into the valleys below. From the pass, drive downhill for about 26km through the forests of blue pine, fir and oak and arrive at Haa, a picturesque remote valley, which has only recently been opened to tourists. We will spend some time this afternoon hiking in the Haa Valley. We’ll be getting acclimatized to the higher altitude and preparing for an even more adventuresome hike tomorrow. Spend the night in Hatoey village at a traditional house converted to a modern lodge. This morning we return to Paro via Chele La Pass again. From the pass we will walk along the ridges, each higher than the last. You can see stunning views of Mount Jumolhari and Jichu Drake on your right and Mount Kanchenjunga in Sikkim, the world’s third highest mountain, on your distant left in clear weather. If you wish to be more adventurous, you can go up to the highest ridge, Kungkarpo which stands at about 13,780 feet – the spot for sky burials. Take a well-deserved rest and enjoy the spectacular views of the Himalayas. Later we hike back to our vehicle and drive to Paro. We drive to Paro airport for our domestic flight to Bumthang Valley. This 45-minute flight gives us spectacular views of the long east-west lateral highway as the plane glides above the highway and the border with Tibet in the north. On arrival we explore Chamkhar Town where we will be spending two nights to enjoy the Jakar Festival. We spend today enjoying the Jakar festival dances and celebrations with locals of Bumthang and nearby villages. The festival is in honor of the teachings of Guru Rinpoche who came to Bhutan in 746 AD and introduced Buddhism. The mask dance festival is believed to bless onlookers, cleanse sins, and bring good fortune. People of all ages dress up in their best attire and come to witness the festival. It is a good opportunity to mingle with the locals. Overnight in Chamkhar. Today we drive to Phobjikha Valley with a stop in Trongsa for lunch. The road gradually ascends to Chendebji Chorten and then to Pele la Pass (10,989 feet). With an alpine environment of rhododendrons and dwarf bamboo, the pass is the boundary between West and East Bhutan. 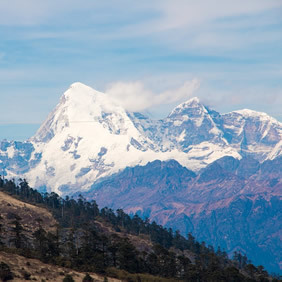 During clear weather, you can view the high, snow-capped peaks. We eventually leave the highway and cross a small pass blanketed with dwarf bamboos and arrive at Phobjikha village, the winter home of the black-necked cranes. Overnight in Phobjikha. This morning we attend the Black-Necked Crane Festival with the people of Phobjikha and nearby villages. The festival comprises a variety of cultural shows and mimicry of the crane dance, depicting the graceful character of the cranes. After lunch, we set out for an exploratory hike in the Phobjikha Valley and its villages, passing close by the crane roosting habitats. At this time of the year, you can see cranes that have migrated from Tibetan plateau. You will also visit the Crane Information Centre, which instructs about cranes, their annual migration, and the valley environment. Overnight in Phobjikha. Today we drive to Punakha. 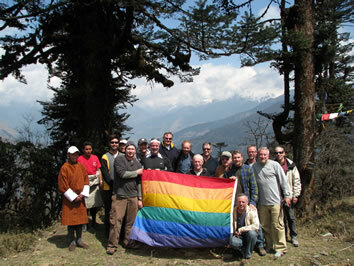 En route we stop at Metsina and hike through rice paddies and up to the Chimi Lhakhang Temple. This temple is dedicated to the great Yogi of 14th century known as Drukpa Kuenley, or the "Divine Madman," who is believed to bless women who seek fertility. We will see plenty of sacred phallus! Overnight hotel in Punakha. Today we take a hike to a local village. The village is reached by crossing a suspension bridge, which is the longest in Bhutan. We have an opportunity to explore the village farmhouses and learn about their architecture and the lifestyle of those who live here. A traditional lunch will be served in one of the farmhouses with Bhutanese butter tea and “ara” a local wine. After lunch we drive through other villages to reach Samdhingkha (put-in) where our rafting crew will be waiting. We take an exhilarating raft adventure on the Pho Chu River with stretches of Class II and IV rapids. We raft downstream in gorgeous mountain scenery past villages, sandy embankments and continue until we reach the placid section of the river below the Punakha Dzong. Overnight at a hotel in Punakha. After breakfast, visit the Punakha Dzong, which is stunningly situated in between two rivers like an anchored ship. Later drive to Thimphu, via Dochula Pass, where we have lunch. Then we continue driving to Thimphu and upon arrival visit the School of Arts and Crafts (also known as the Institute for Zorig Chusum) and Folk Heritage Museum. Later in the evening visit the Majestic Tashichodzong. Overnight hotel in Thimphu. This morning we visit the King's Memorial Chorten, built in memory of the third King of Bhutan who reigned from 1952-1972. 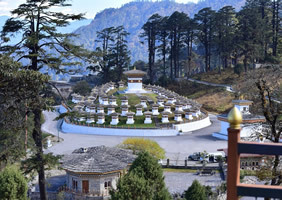 Other place include Kuenselphodrang, where a giant Buddha statue is located, the zoo which contains the national animal of Bhutan (the takin), and the nunnery temple. After lunch, we visit the popular Weekend Market, the largest vegetable market in the country. You can see the enormous variety of foods grown in this country, including basket upon basket of fiery chilies, fresh cheese, and fruits. In addition, many stalls contain Bhutanese handicrafts and household items. This is a good opportunity for photography and to mingle with locals who come from the nearby villages to sell their farm products, and to buy some souvenirs. This evening enjoy free time to explore Thimphu town on your own. Overnight at a hotel in Thimphu. This morning we drive to Paro. Sightseeing in Paro includes the Rinpung Dzong, meaning “fortress of the heap of jewels". It has a long and fascinating history. Along the wooden galleries lining the courtyard of the Rinpung Dzong are fine wall paintings illustrating Buddhist lore. We then visit Kyichu Lhakhang, the oldest temple in the country built by the Tibetan King Songtsen Gampo in 8th century. In the afternoon take some time to explore Paro town and do more souvenir shopping. Overnight at a hotel in Paro. 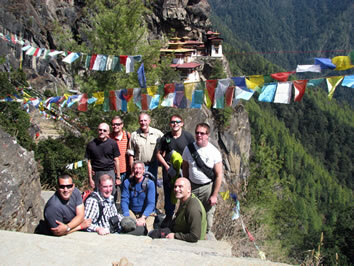 Today’s activity is one of the highlights of the tour – the hike to Taktsang (Tiger’s Nest) Monastery. It is Bhutan’s most famous monastery. It is breathtaking, situated at 10,400 feet and perched on the edge of a steep cliff about 3,000 feet above the Paro Valley. Guru Rinpoche is said to have flown on the back of a tigress from Singye Dzong in Lhuntse to meditate in a cave where Taktsang Monastery now stands. Lunch is served in the Cafeteria Restaurant, located about halfway up the mountain. After having explored the monastery, we hike down to the valley floor. We celebrate our fantastic tour in Bhutan with a Farewell Dinner this evening, and one more overnight stay at a hotel in Paro. Enjoy a relaxing morning at our beautiful hotel until check-out time. After lunch, we drive to the Paro Airport to catch our flight back to Bangkok, Thailand. Departure time is 4:10pm, arriving in Bangkok at 9:50pm. Tour services end with our landing in Bangkok. Schedule your departing flight from Bangkok no earlier than 2:00am on Tuesday, November 19. If you need to extend your stay in Bangkok in order to take a flight the next day, we recommend that you book the Novotel Bangkok Suvarnabhumi Airport Hotel directly. • Sightseeing activities, entrances and meals as listed in the itinerary. Le Meridien Paro, Riverfront is the perfect destination which offers life time opportunity to live and experience the country’s exotic culture and natural beauty with a mix of luxury and comfort. Located 10 minutes from Paro International Airport, Le Meridien Paro, Riverfront is situated on the edge of the Paro River, offering panoramic views of the Eastern Himalayas, making it a perfect stopover for anyone visiting Bhutan. The timeless art of leisure can be freely pursued with amenities that include Explore Spa and an indoor heated pool, as well as a Fitness Center. Two restaurants, Bamboo Chic and Latest Recipe and Latitude bar offers a diners an exquisite sensorial experience. 59 guest rooms, including seven suites, are chic retreats designed with the curious traveler in mind. Each offers striking Himalayan Valley and Paro River views, as well as signature LM BED and separate soaking bathtub. The perfect retreat for mind, body and soul, Yu-Gharling Resort offers the best of all including the ultimate in rejuvenation and relaxation. It features 14 spacious, well appointed rooms in the main building while 30 large and beautiful rooms with balcony in separate seven cottages. All rooms offer spectacular views of Chokhor Valley. The resort boast of a separate Bar with pool table and interesting collection of local and international beverages. The restaurant serves Italian, French, Bhutanese, Chinese & Indian cuisine. Yu-Gharling is also equipped with full fledged SPA - Health Club, consisting of Sauna, Steam, Jacuzzi, Traditional Stone Bath and Massage centre. Hotel provides a warm friendly atmosphere and a very personal service to every indiviual guest. Norkhil Boutique Hotel & Spa features a fitness centre and terrace. Among the facilities of this property are a restaurant, a 24-hour front desk and a business centre, along with free WiFi. The rooms at the hotel are fitted with a seating area, a flat-screen TV with satellite channels and a private bathroom with free toiletries and a hot tub. Norkhil Boutique Hotel & Spa provides certain units that include a balcony, and the rooms are equipped with a kettle. All guest rooms feature a desk. Rediscover the uniqueness of Bhutanese tradition. As you prepare to land at the Paro International Airport, the eye catching Tashi Namgay Resort opposite to Bhutan’s only international airport would greet you with the warmth and serenity that you hope to achieve on your visit. The resort is set amidst five acres of lush foliage and green lawns. Located conveniently in the heart of Paro valley but away from the distractions of the main town, Tashi Namgay Resort offers you a calm and peaceful environment within a five-acre compound. Unique blends of traditional Bhutanese and modern architecture have been provided for, yet at the same time offering you all the amenities of a modern lifestyle. Free WiFi access is available in the public areas of this resort. The accommodation will provide you with a seating area. Featuring a shower, private bathroom also comes with a hairdryer and bathrobes. You can enjoy mountain view from the room. At Tashi Namgay Resort you will find a 24-hour front desk, a garden and a terrace. Other facilities offered at the property include a shared lounge and a tour desk. Passport (minimum validity of six months) and visa required. You will receive your visa upon arrival at the Paro Airport. We make all arrangements for this service, and the price is included in your tour cost. Instructions will be provided closer to departure. Just be sure now that your passport will be valid until May 19, 2020. If not, you will need to get it renewed. None are required, but it is highly recommended that you get a tetanus booster if you have not done so in several years. 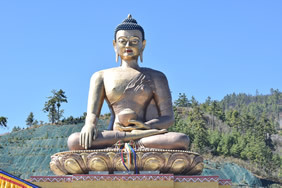 We recommend that you read the CDC’s Health Information for Travelers to Bhutan. 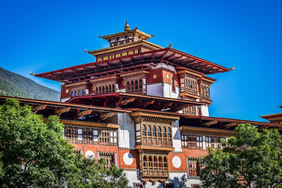 There is currently no separate departure tax required of visitors leaving Bhutan other than that included with the cost of your airline ticket. On this tour, international airfare is NOT included. You will need to get a round-trip international air ticket to Bangkok. You will need to arrive in Bangkok before 2:00am on November 5. Book your return flight from Bangkok after 2:00am on November 19. There are about a dozen Business Class seats on our international flight from Thailand to Bhutan. It is possible to upgrade to Business for $150.00 round trip. Please indicate your desire for this upgrade on your reservation form. The upgrades will be sold in the order the requests are received, depending on remaining availability. One of the secrets to enjoyable travel is packing light. This tour encompasses many climates and the weather will range from warmer in the lower valleys to cold in the high mountains. Instead of packing everything to cover any situation, we recommend taking layers of lighter clothes you can easily put on or take off, depending upon the conditions encountered. They can easily be laundered and reused. Please limit yourself to one suitcase and a carry-on bag. In November, the average daily temperature can range between 40 to 70 degrees in various locations. The Ngultrum is the national currency of Bhutan (the code is BTN when looking up exchange rates). ATMs are not available in Bhutan, and credit cards are only accepted between the hours of 9:00 am and 5:00 pm, so we encourage you to bring plenty of cash and exchange into local currency as needed. Use credit cards whenever possible to conserve your cash. We will offer a group tip to guides and drivers, and more details will be provided before departure. The recent trend in travel is for travelers to finalize their plans much closer to departure time than was customary in the past. While we try to be as flexible as possible we often must turn away last minute registrants because we relinquish hotel space and air reservations 8 – 12 weeks prior to departure! Please keep this in mind when making your travel plans.